Members make all the difference! To provide our contractors with a highly skilled workforce. To unify our contractors and members working together and maintaining safety, profitability, and quality to the highest standards. Have you ever lost your job because your Employer:? The Union does not want us they just want the Company. It does not benefit us to organize the company and cut the employees loose. The union has long understood that the only way we can insure decent wages and working conditions for all sheet metal workers, is to manage the supply of skilled manpower. If the Union comes in they will get rid of us and bring in their own people. Again this will not benefit us in any way. We want you to become union members and stay employed with your current employer. S.M.W.I.A Members have more employment opportunities that non members. S.M.W.I.A Members have the opportunity to work for all union contractors. 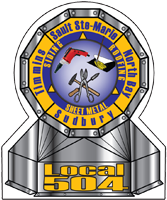 S.M.W.I.A Members also have the option of traveling to other local unions for work, through our local to local referral system.